KARACHI: Former chief minister Syed Murad Ali Shah, who has been nominated by his party for the same office again, has said that the new Pakistan Peoples Party government will pay special attention to infrastructure development, poverty alleviation and improvement of health and education sectors in the province. He said this while talking to media after laying a wreath and offering fateha at the Quaid’s mausoleum on the occasion of the country’s Independence Day on Tuesday. He was also accompanied by PPP’s Sindh chapter president Nisar Khuhro, Waqar Mehdi, MPAs Sohail Siyal, Saeed Ghani, Imdad Pitafi and Qasim Siraj Soomro. 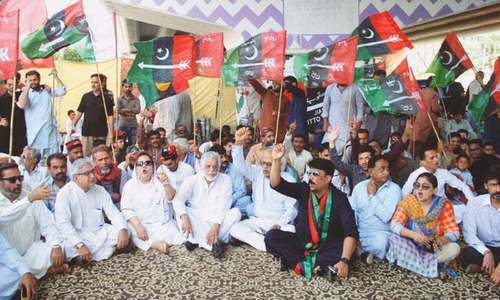 He said that PPP chairman Bilawal Bhutto-Zardari had laid a great responsibility on his shoulders by nominating him as the Sindh chief minister. He added that every district and every city of the province would be given equal attention to develop them and resolve public problems. Mr Shah said that his government restored peace in Karachi and made it the “city of lights again. Now we are going to make it one of the beautiful cities of the world,” he said. In reply to a question, he said that the people of Sindh had reposed their confidence in the PPP because it served them. “It is the PPP which has always fought for the right of the people of Sindh and always given them employment opportunities. We have improved the health sector and worked a lot on the Thar coal project which is set to produce electricity,” he said. He said that unemployment was a serious problem and this time his government would create more employment opportunities in the government and private sectors. To another question, he said the Pakistan Muslim League-Nawaz government had announced the Rs25 billion Karachi Package, but till the end of their tenure they did not even release Rs25. 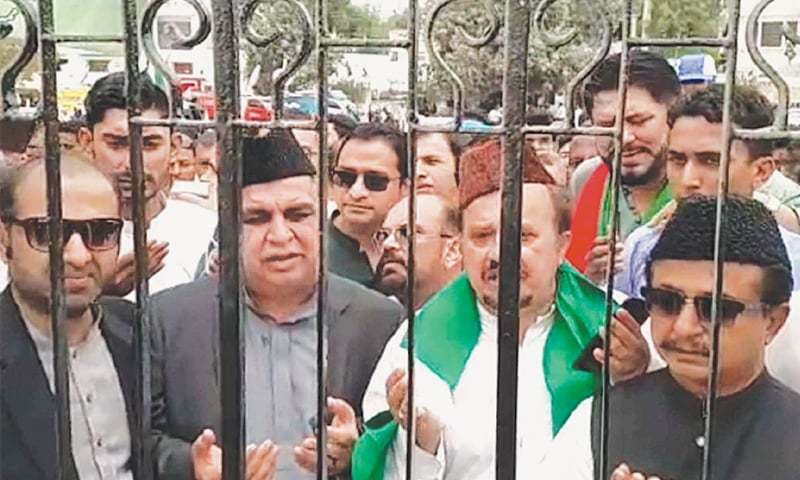 While the former Sindh CM along with his associates visited the Quaid’s mazar and offered fateha, a delegation of the Pakistan Tehreek-i-Insaf was stopped at the mausoleum’s gate and not allowed to enter. Imran Ismail, who has been named as the new governor of Sindh, was leading the PTI delegation comprising Haleem Adil Shaikh, Firdous Shamim Naqvi and others. The delegation waited at the gate for quite some time. Later, the PTI leaders offered fateha and went back. PTI spokesman MPA Jamal Siddiqui told Dawn that the door of the VIP gate of the mausoleum was locked when the party delegation arrived there. He said that the mazar administration was not duly informed in advance about the presence of Imran Ismail in the PTI delegation. They, however, tried to convince security guards there to open the gate, but they expressed their helplessness, saying the gate was locked and could be opened only by an official of the management of the mazar. Caretaker Sindh CM Fazal-ur-Rahman has said that father of the nation Quaid-i-Azam Mohammad Ali Jinnah had a dream to make Pakistan a welfare state and we all are working hard in that direction. Earlier, the caretaker CM along with acting Governor Agha Siraj Durrani performed the flag-hoisting ceremony at the Quaid’s mausoleum and received Independence Day felicitation from diplomats of different countries and members of civil society who attended the day’s event at the mazar. During the flag-hoisting ceremony, the national anthem was played and all guests and schoolchildren sung it. The chief minister met the children and lauded their spirit. The CM and the acting governor also planted a tree each in the garden of the Mazar-i-Quaid. There will be no infrastructure development or poverty alleviation unless corruption is controlled. Since PPPs survival is dependent upon corruption, I do not see anything substantial happening in the next five years. I am not sure how much PTI lead federal government can help Sindh get out of corrupt mess. Unfortunately Karachi will still be among the least liveable cities in the world. First make sure no more children die in Thar. Poverty alleviation and infrastructural development are two different things....For the sake of humanity kindly think for poverty alleviation by bringing reforms in education, health, water supply and sanitation, job creation and agricultural reforms favouring haris and small land owners....not the big contractors and large land lords. Old faces and old rhetoric will not bring any change in the fate of province or its subjects. Previously, when Qaim Ali Shah was replaced with Mr. Murad Shah, the people expected that this second Shah will work for the progress of the province, but unfortunately, he also proved good for nothing in his first tenure. How can he be good man now? Forget anything positive under such leaders. The way forward, is really to do as much as you can do yourself and with the help of others you know. There are many institutions set up in Karachi with private initiative, because the people involved are interested, capable, competent, persistent in their resolve to do good. We who live in Karachi know about the corruption, lethargy, incompetence, that is pervasive, and deeply ingrained. What were you doing during the past ten years of your party's rule? Poverty development? i wonder what the PPP was doing last 10-12 years. The city has gone bad to worse, but these corrupt PPP walas were just crying about dead bhuttos! WHO are they making fools of? After this dismal track record of last two tenures of PPP regime, people of Urban Sindh, at least, have no faith in any claim by PPP. More and more corruption under the banner of new slogans. PPP, thy name is corruption, incompetence, and nepotism. The people of Karachi have now pinned their hopes to PTI. Lofty goals but first help Thar in its misery. Show progress of projects underway. People have invested their votes in you. Prove your critics wrong and work with IK. Infrastructure development and poverty alleviation is PPP government's "new" agenda in Sindh. Then what was PPP government's "old" agenda in Sindh for last 10 years? Land grabbing, water tanker mafia, kidnapping, bhatta and money laundering? The people demand full investigation of those 10 years which devastated Sindh where the situation became bad to worse. No political party or politician past or present can be above the law. PPP's pack of lies as usual. Shame on Murad Ali Shah for returning to the office after his last pathetic show of performance. How elect the people such party it is disgusting? Faryals, etc., will be behind the bars for years. But then why are you demolishing "infrastructure" that was raised during last five years due to corruption in your previous tenure. Isn't it embarrassing?